Located in Miami, Florida, Stonexchange is a manufacturer and importer of premium quality marble thresholds for use in both residential and commercial designs. Our company fabricates transition saddles in all the popular styles and color shades, and our bulk-order system and full-crate delivery operation means tremendous savings for our commercial clients. Take a look around and see what the competition has to offer. Stonexchange promises something that few other suppliers can: the lowest possible per-piece cost on large-scale orders of natural marble stone thresholds, combined with superior product quality. Contemporary designs often combine a classical look with modern architecture and furnishings. Natural stone is timeless when it comes to style, and most property owners and would-be homeowners prefer the inclusion of marble, granite, or travertine into the overall design of the bedroom, bath, kitchen, or office foyer. Although heavy and therefore expensive to transport, marble is nonetheless quite affordable when purchased in bulk quantities. Building architects know that the only way to incorporate marble into the final draft is to sell their idea to a development company that has access to natural stone in bulk quantities and at wholesale prices. Transition saddles – also known as floor thresholds – are considered an accessory because they match other stone fixtures or flooring and serve to complete the creation of positive ambience in the interior living or work space. These pieces are manufactured as a flat piece of stone with beveled sides and rounded edges. They are usually placed in a doorway where two different floor surfaces meet. Natural stone is favored as a material for floor saddles not only for its regal appearance, but also because stone – especially marble – creates a functional water barrier that eliminates moisture intrusion along floor covering seam lines. When carpet meets flooring tile, some sort of covering needs to be in place to ensure there is absolutely no way for moisture to be drawn by gravity to the subfloor material. A wonderfully crafted threshold acts as this water barrier. Thresholds made from natural marble stone are in high demand because of the increase in interior designs that combine classic and contemporary ideas. However, the number of threshold manufacturers producing top-quality product on a reliable, dependable schedule is rather small. Stonexchange offers commercial clients the opportunity to obtain the finest marble saddle thresholds in bulk quantities, and these products are priced to please. Thresholds made from natural marble stone are fashioned in three distinct styles. The first is a standard double bevel saddle that has short, oblique angles along both of the long sides. The bevels are only about 1/4-inch in length and the saddle itself is approximately 5/8-inch in thickness. These thresholds are usually placed in bathroom entryways and in bedroom doorways. The standard length is 36 inches – the same as the interior width of the door frame – and the saddle is either polished or honed prior to installation. Standard double bevel thresholds are manufactured in various widths, from 2-6 inches. Hollywood styled thresholds have longer, 1 3/8-inch bevels. Single Hollywood bevel saddles are rounded on one long side and have the bevel on the other side. These saddles are often used when one flooring surface is slightly raised above the other, or when a marble floor height is designed to slope around the perimeter. Single Hollywood bevel thresholds are quite popular as a perimeter marble floor covering, even when the tiles themselves are of a different color shade and pattern. Double Hollywood bevel thresholds have a wide bevel along both long sides. These floor saddles are generally placed in doorways where pedestrian foot traffic is heavy or where wheelchairs will likely be used. For this reason, double Hollywood bevel saddles are often specified as the material of choice for hospitals, hotels, resorts, retirement communities, and public buildings such as courthouses. Stonexchange carries all three types of transition floor saddles in several of the most popular and oft-requested color shades. Our premium quality thresholds are offered in shades that are the perfect replacement for some of the most commonly used pattern styles specified in building plans. Because we manufacture our own products on a schedule that matches our sales volume, customers who purchase from us can expect a full inventory of material throughout the year, even during the slower, ramped-down winter building season. Designers often specify a medium shade marble stone for thresholds, sills, and floor tiles. The use of cream/beige marble allows for the greatest amount of flexibility when it comes to furnishing and refurnishing a home or office interior. Neutral shades don’t have to match perfectly for the overall effect to be positive. Stonexchange manufactures and distributes a superb Marfil transition saddle. This product color is known as Crema Sahara Marfil and is the perfect replacement for Bursa Beige, Botticcino, or Sicilian Cream shades. Our Crema Sahara Marfil thresholds are available in standard double bevel style, single or double Hollywood bevel style, and come in a variety of widths. Our Nuevo White Carrara floor saddles are off-white with gray streak patterns. This is a very popular color choice for use in commercial buildings, especially courthouses, post offices, and hotels. 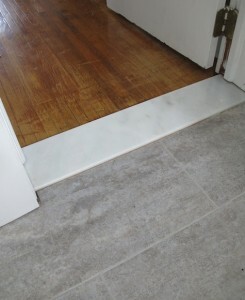 White Carrara thresholds are a good match for building plans specifying Alabama or Georgia White, Cherokee, or Vermont marble. This color resists fading and can be repolished hundreds of times without loss of reflectivity. Stonexchange manufactures White Carrara floor saddles in the same styles and widths as our popular Crema Sahara Marfil shade. Both of these products are sold as full-crate orders containing 100 or 200 individual pieces, depending on width. Both products have been expertly cut and shaped, have been machine-rounded, and have a high-quality polish. They are ready for immediate installation upon delivery. We also manufacture and distribute white thresholds made from engineered stone. Our beautiful Pure White Thazoz thresholds are specifically designed for use in high-end projects such as office suites and resort communities. Made from a combination of glass and specialty resins, these incredibly bright thresholds are free of any streaks or spots. In addition to our line of marble threshold products, we also manufacture an extremely dark black granite saddle. Known as Absolute Black, this product is a perfect match or replacement for any building plan specifying Galaxy or similar shading. This threshold is also available in various widths and is cut in all three styles mentioned above. Many designs incorporate the use of several different natural stones placed in strategically located areas around the building interior. For example, the living room and bedrooms may have marble flooring and accompanying marble thresholds. However, the bathroom may be lined with travertine walls. The installer will need to find a suitable supply of travertine thresholds and shower curbs in addition to the marble saddles placed elsewhere. Stonexchange has this problem solved because we manufacture high-quality medium ivory shaded thresholds made from travertine. Our clients can request a mixed-material order at any time, and for medium-size orders involving less than 1000 thresholds, Stonexchange can process and deliver in just a few business days. We have part-ownership of our quarrying operations located overseas. We own the manufacturing centers where our products are fabricated. When you purchase from Stonexchange, you are dealing directly with the source of raw materials used to create our finished products. In other words, you will not pay inflated prices because of reselling of product. We do not buy material from an outside party, nor do we rely on others to sell us natural stone in its raw form. Our manufacturing and import business is constant throughout the calendar year, meaning that our clients – including retail merchants and home improvement store chains – have direct access to premium quality marble whenever they need it. Our bulk importation method cuts down on freight and import tariff costs, and we pass this savings along to our commercial clients. Instead of relying on brokers and resellers to supply you with natural marble stone thresholds, go directly to the materials source. We invite you to contact our company today and find out how much you can save on the finest marble products available. Remember, we don’t sacrifice quality for discounted prices. Instead, we deliver the very best for less, and we go the extra mile to make sure you receive exactly the right product style on each and every order you place with us.